With top-notch party services, decorations, delicious food, and friends and family, you won't even need to leave your home for your kid's next birthday party! This comprehensive list has all the top at-home parties in NY that will turn your house into a fun-filled party spot. Click here to see entertaiment services that will help you plan a fun and exciting kids party in your home in New York. You can also check out this awesome guide to children's entertainers who will perform delightful puppet shows for kids in NY. A Bilingual Party Entertainer in NY! 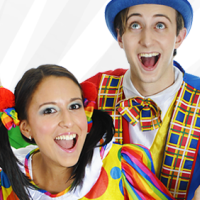 If you're looking for a multi-talented party entertainer for your kid's next at-home party in NY, then look no further! Apryl Cadabra will perform magic and comedy shows, and will also do professionaly face-painting! The kids will never be bored - they will be laughing and having a blast from start to finish! As a bilingual, Apryl Cadabra can also perform her entertainment in Spanish! Book Apryk Cadabra now, and throw an amazingly fun kid's at-home birthday party in NY! Kid's Entertainent & Rental Services in NY! Whether you're looking for entertainment, rentals, or services, Celebration Entertainment has all you could ever want when throwing an at-home party in NY. 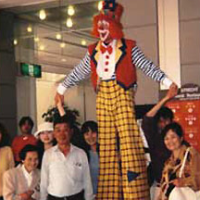 Kid's entertainment service includes magicians, cartoon characters, jugglers, clowns, mimes and bouncy house rentals. You can have endless amounts of children entertainment right in your back yard! Along with the entertainment, Celebration Entertainment also offers event production services and rentals, including lighting and audio, music, concept development, chair and table rentals, tent rentals, generators, and more! Singing, Dancing & a Puppet Show in NY! An at-home party in NY is just not the same without a musical moose to brighten up the party! 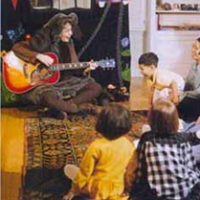 Hire Marcia the Musical Moose for your kid's next birthday party, and watch the children have an awesome time singing along to her guitar music, and watching a magic show and a puppet show. You even get the option of choosing between a variety of puppet show themes, including the Jungle Safari, the Barnyard Story, the Dinosaur Adventure, and more! A Pizza-Making Party in NY! 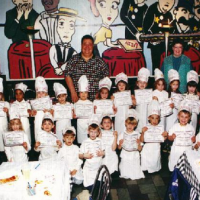 Your kids will have a blast at Chef Carl's Make a Pizza Party! Bring the fun to your at-home party in NY, and turn your home into a professional pizza kitchen. Each kid will receive a pizza-making kit, and they will watch an instructional video about how to make them. It is fun from start to finish! A unique and enjoyable at-home party idea in NY, having a Chef Carl's Make a Pizza Party is a sure success for kids of all ages - they get entertainment and lunch all in one! Party Entertainment & Rentals in NY! Make your kid's at-home birthday party in NY the best it can be - have Professional Kids Entertainment come for an unforgettable time! They will provide clowns, cartoon characters, magicians, princesses and bouncy slides that will keep the children entertained throughout the entire party. 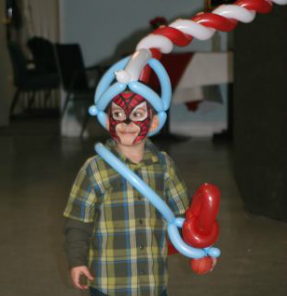 You have the choice between a variety of party packages, including fairy packages, character packages, clown packages, and more. Professional Kids Entertainment will also provide music and other types of rentals that will make your party in your NY home memorable and fun. All Types of Party Entertainment Services in NY! If you can come up with it, Party Smarty Entertainment probably offers it. This at-home party service in NY offers numerous party services and entertainment for your little one's special day. They have party favors, food machines, and entertainment, including airbrush T-shirts, flip-flop making, caricaturists, popcorn machines, warm pretzels, donut decorating, circus acts, DJ's, and more! The fun never ends with Party Smarty Entertainment. Book this awesome party entertainment service for your kid's next party in your NY home, and enjoy an unforgettable event. A Carnival in your Own Back Yard in NY! If you're looking for an affordable and reliable party service that comes in you in NY, then Dougherty's Party Service is the place for you! 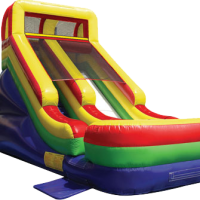 You can rent rides and inflatables, game machines, concessions, and more to fit your kid's NY at-home party needs. Why go out of your way to an amusement park when you can get all that in your own back yard? A sure success among children of all ages, Dougherty's Party Service will turn your dull back yard party into a fun-filled and enjoyable experience!